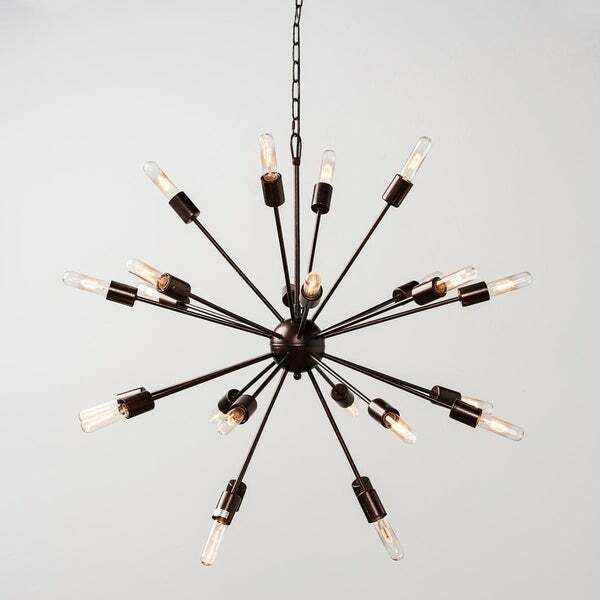 The timeless mid-century design of the Kosas Home Aislinn Starburst Chandelier will add dramatic flair to any room of your home. With 24 orbital bulbs providing stunning illumination this chandelier is sure to be a conversational piece. Professional installation is highly recommended. To clean dust lightly with a feather duster or clean dry cloth. Dimensions 33.0 In. X 33.0 In. X 33.0 In. "How long is the chain and wire?" "what does the top of this chandelier look like? i see a chain, but it is one that has a fixture for the ceiling?" The chandelier is held to the ceiling by a canopy.